Where mentoring relationships exist, breakthrough research follows. Dr. John L. Wood, the University’s Robert A. Welch Distinguished Professor of Chemistry, averages 60 to 70 hours a week in the east wing of the Baylor Sciences Building (BSB), arriving to his office before the sun rises Monday through Saturday. A world-renowned chemist and cancer researcher, Wood is recognized for his impactful work in an area of chemistry called natural products synthesis or total synthesis, which involves re-creating complex, naturally occurring molecules in a lab setting. These molecules—derived from soil samples, plants or fungi—demonstrate biological activity that could be useful to pharmaceutical companies developing new drug therapies that target cancer. Wood, who spent 13 years on faculty at Yale University, and six at Colorado State University before coming to Baylor in 2013, readily concedes that he doesn’t necessarily measure success in his lab in strictly chemical outcomes. And produce he does. The John Wood Group has sent researchers from Baylor to such academic institutions as Massachusetts Institute of Technology (MIT) and Harvard University, as well as industry giants AbbVie and Genentech. Wood says such success goes a long way in recruiting top-flight students and faculty to Baylor, and, in turn, allows the University to compete in every way with the nation’s highest-ranked research universities. Mina Nakhla, PhD ’18, begins a post-doctoral appointment at Harvard this spring, following the footsteps of fellow John Wood Group alumna Monica McCallum, PhD ’16. Nakhla says having Wood’s name on his curriculum vitae (CV) is invaluable. 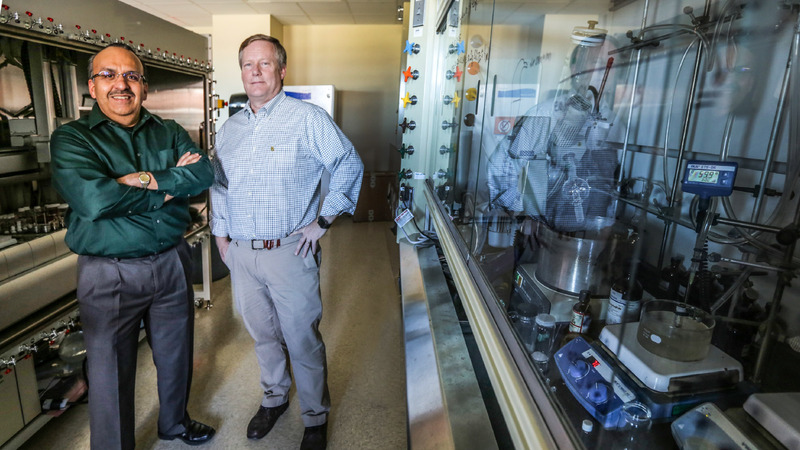 Recruiting renowned faculty like Dr. Daniel Romo (left) and Dr. John Wood (right), and building and equipping labs where faculty, graduate and undergraduate students explore, discover and collaborate together are priority intiatives of Give Light: The Campaign for Baylor. For information about supporting faculty research at Baylor through a philanthropic gift, email GiveLight@baylor.edu. “His name carries an enormous amount of weight, and he has produced some famous chemists,” Nakhla says. Two such chemists for whom Wood served as doctoral advisor while at Yale are currently at the California Institute of Technology (Caltech)—Dr. Sarah E. Reisman and Dr. Brian M. Stoltz. Convincing Wood to leave his home state of Colorado for Waco took every bit of two years. Dr. Patrick Farmer, chair of the Baylor Department of Chemistry and Biochemistry, says the original offer included the University’s Welch professorship, endowed by The Welch Foundation of Houston and most recently held by the late Dr. F. Gordon A. Stone. Ultimately, Wood’s commitment was sealed when Baylor was awarded a five-year, $4.2 million grant by the Cancer Prevention and Research Institute of Texas (CPRIT) in late 2012. In 2011, the same type of CPRIT award helped The University of Texas MD Anderson Cancer Center recruit Dr. James Allison from New York’s Weill Cornell Graduate School of Medical Sciences. Today, Allison shares the 2018 Nobel Prize in medicine for his breakthrough research in immunotherapy. The award that brought Wood to Baylor has allowed for the assembly of what is easily a dream lab. Inside the Baylor CPRIT Synthesis and Drug-Lead Discovery Laboratory (CPRIT Lab), long rows of counter-height work tables are crowded with instruments, a scatter of flasks and half-full test tubes. Interminable formulas are scrawled in marker on every wipeable surface. Near one active work station, a dune of unidentified powder awaits its intended purpose, along with fluids of varying tint and opacity in vials. There is, of course, the quintessential glovebox—its dark, rubber gloves hang limp and ready for use, inert as the air encased inside. Acetone, or some other solvent, perfumes the lab, but Wood says he doesn’t smell anything unusual. To the casual visitor, the CPRIT Lab looks much like the curated set of a big-budget sci-fi flick. To someone like Dr. Jacob Timmerman, the lab looks like a jackpot. 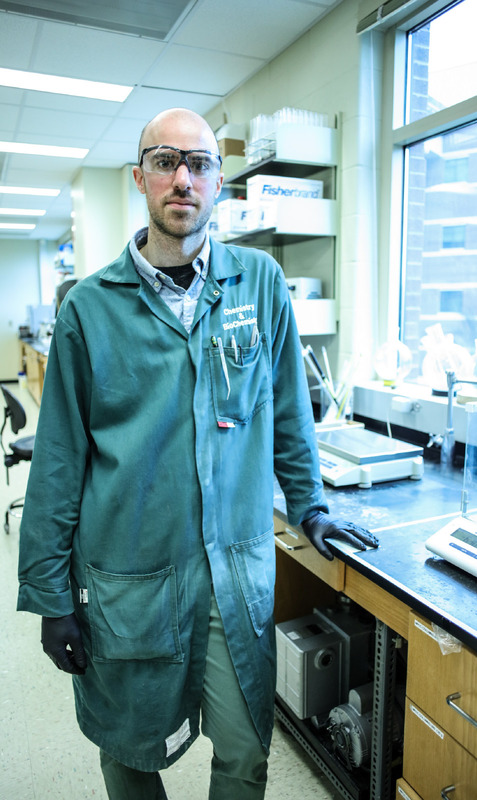 Timmerman, a post-doctoral researcher with the John Wood Group, began working in labs as a freshman at the University of North Carolina at Chapel Hill. He recently accepted a full-time position at San Francisco biotech corporation Genentech. It is rare, for instance, for a chemistry department to have access to five nuclear magnetic resonance (NMR) instruments ranging in strength from 300 to 600 megahertz (MHz). These instruments are able to provide details of the structure of a molecule and its individual atoms—something approaching an “image”—and are among the most definitive methods in identifying organic compounds, proteins and other complex molecules. With a portion of the CPRIT funding (roughly $1.5 million), two aging NMRs were replaced in 2013 with three new, more powerful ones. One such established investigator is Dr. Daniel Romo, The Schotts Professor of Chemistry and co-director of the CPRIT lab. Recruited in 2015 from Texas A&M University, Romo says the chances of his move to Baylor would have been nil if the state-of-the-art NMR instruments weren’t in place. Like Wood’s research group, the Romo Group focuses on synthesizing compounds derived from nature and understanding their biological effects in cells at the molecular level. Aside from the instrumentation available, applicants to the graduate program also care about the facilities in terms of the building’s appearance and the work environment, Wood says. And the CPRIT lab is no subterranean bunker. Large, picture windows line the north wall, drenching everything in natural light. The view from the second floor of the BSB allows strained, goggle-protected eyes to rest on some point in the distance or take in a Quidditch match on the playing fields below. Additionally, the price the John Wood Group pays to run instruments like the 600-MHz NMR is negligible compared to costs elsewhere. In his group, Wood isn’t the only one logging long hours. His researchers are expected to spend a minimum of 60 hours a week in the lab, and he is very up-front about this expectation when interviewing prospects. However, Nakhla says many researchers work 80- to 90-hour weeks. To recap, total synthesis means putting a molecule together a few atoms at a time using commercially available materials. The catch is that for most molecules, there are an infinite number of conceivable syntheses. It is no stretch to view a completed total synthesis as one might a sculpture by Rodin or Bernini. Often, the molecules Nakhla and others synthesize in lab are not exactly plentiful in nature. “In some cases, hundreds of kilograms of plant matter are ground up in order to extract the compound, to produce a single sample of just a few milligrams to use in lab.” Nakhla says. The chemistry he and his fellow researchers develop and publish enables the efficient production of these molecules on an industrial scale. Getting it right can take many months, years or even decades. Nakhla’s recent synthesis of a compound called aspergilline A, which exhibited anti-cancer activity, took approximately two years to complete. Another compound known as phomoidride D required 22 years and the dogged patience of 19 John Wood Group chemists to synthesize. If Wood seems uninterested in the commercial viability of his work, that’s because he is—entirely. “I don’t believe the university’s job is to be in the drug development business,” Wood says. “Pharmaceutical companies are far better than universities at developing drugs, getting them through clinical trials and then to market. Senior biochemistry major Alexandra Beard is one of three undergraduate students selected to work with the John Wood Group. Beard, who is currently applying to chemistry doctoral programs, says she fell in love with total synthesis during a summer 2017 internship at the University of North Texas. 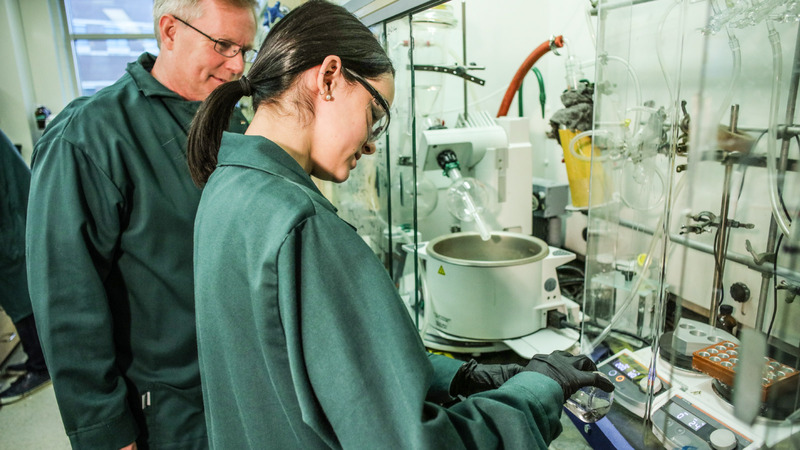 Currently, she is working on synthesizing a compound she found in an academic paper, even though it doesn’t necessarily exhibit the qualities that may be useful to a pharmaceutical company, she’s learned to be drawn to a challenge. Still, Romo notes that nearly half of all drugs on the market are derived from natural products. Looking at antibiotics and anti-cancer drug therapies alone, that figure jumps to about 70 percent. In the hallway between Wood’s office and the CPRIT lab, large posters feature the chemical structures of hundreds of marketed drug molecules, developed and prepared by researchers at companies like Pfizer, GlaxoSmithKline or Eli Lilly. By varying a lead compound like phomoidride D over and over again, pharmaceutical companies develop the molecules that become the most frequently prescribed drugs in the world. So, the Wood and Romo groups work at the earliest stage of the odyssey known as drug discovery. “I consider natural products a ‘playground’ provided by God for us to explore, synthesize, and harvest for potential medicines,” Romo says. “It’s fertile ground for us to identify lead molecules that may ultimately provide new medicines. 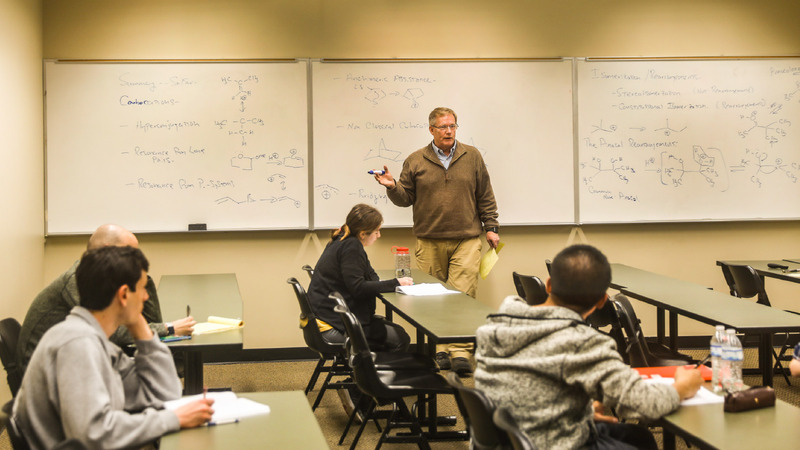 While the compounds being investigated and synthesized in the CPRIT lab may someday lead to a groundbreaking new drug, the greatest impact of Wood’s education-first ethos is on the lives of his students. Now an MIT post-doctoral scholar, Heemal Dhanjee, PhD ’17, still speaks with Wood on a monthly basis—as often as he speaks with his mother and father, he says. The indelible personal and professional support Dhanjee received at Baylor—and continues to receive from afar—reflects a culture Wood has cultivated intentionally. Art historian provides biblical context and insight for centuries-old masterpieces. Members of the Baylor Family discuss the University's commitment to an Unambiguously Christian Educational Environment. Philanthropy and the Public Good course guides students through a rigorous grant process and equips them for lives of discerning generosity. In Baylor's Business Ethics Case Competition, students must navigate competing priorities to determine the most ethical path forward for a company.